WAFFLES: So Boss, if it's a cat holiday today how come I have to work? WAFFLES: But Boss, kissing is hard work. And with these new volume discounts, I don't even think I can make enough scratch to go to chicken ranching school. KATIE: Waffles, you have plenty of scratch. And when you do finally go to your chicken ranching school, I've got the perfect place for you to live. How do you feel about camping? WAFFLES: I don't know Boss. This looks pretty flimsy. And I can't really drive it anywhere, right? It's not like an RV or something. How will I get to chicken ranching school? WAFFLES: Ship??? Like in the water? I KNOW!!! And you can come too. In honor of International Box Day, we picked out a few of our very favorite box photos from previous blog posts. Sometimes Glogirly draws on boxes with her big Sharpie and sometimes she draws on boxes in Photoshop. For Katie, boxes have been more of a spectator sport. She's very cautious about getting into enclosed spaces... especially with Waffles looking on. 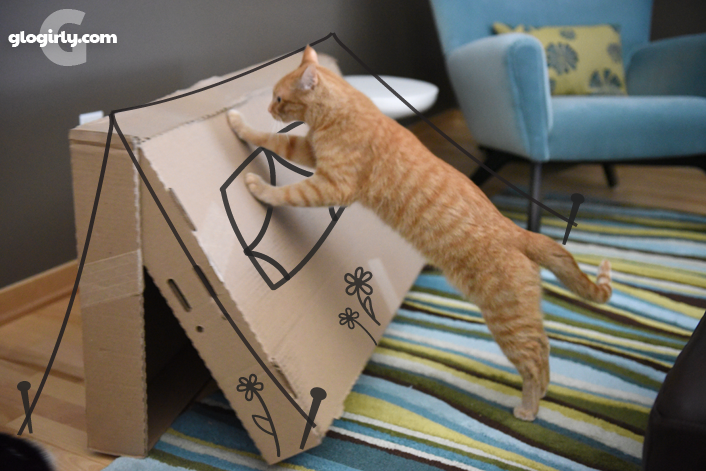 But for the orange daredevil, an open box is an open invitation to fun and games. A box to Waffles is like a playground to a little kid. We'd love to know what kind of adventures he's imagining. I don't care for boxes myself - it's not like I'm suspicious of them. I'm just indifferent. I guess I am weird for a kitty! Happy Box Day! Katie, we don't blame you for being leery. 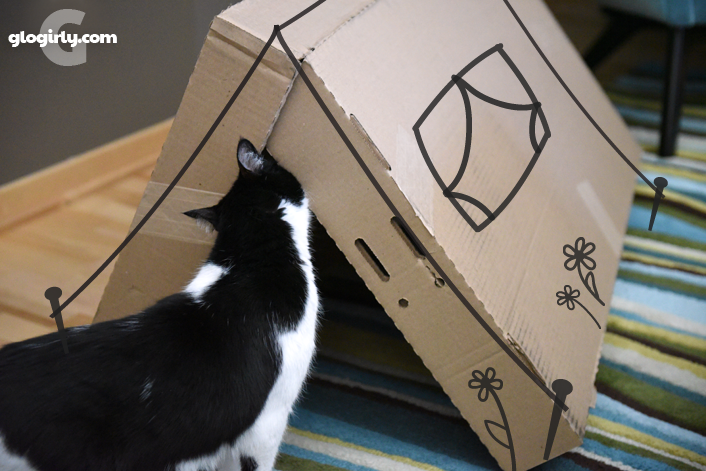 Wow, a tent! A Submarine! Youze guys are really creative over there. Fabulous photos - all! We're sure Katie will include some chicken in the box when she ships you to the chicken ranch, Waffles. Ha ha - Waffles you are something else! Katie - you have to always stay one paw ahead of that boy. Waffles you're off on another adventure!!! Hey, hey! Waffles and Katie! Happy International Box Day!!! Is this a great holiday, or what?!?! I'm glad my mom saw your post on FB or I wouldn't have known. I posted a box retrospective to celebrate the day. Ooooo, ship that boy over here! Oh wait. We gots no chickens today. Darn. 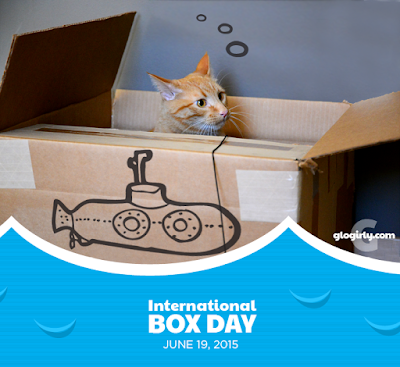 Well, Happy International Box Day anyway! 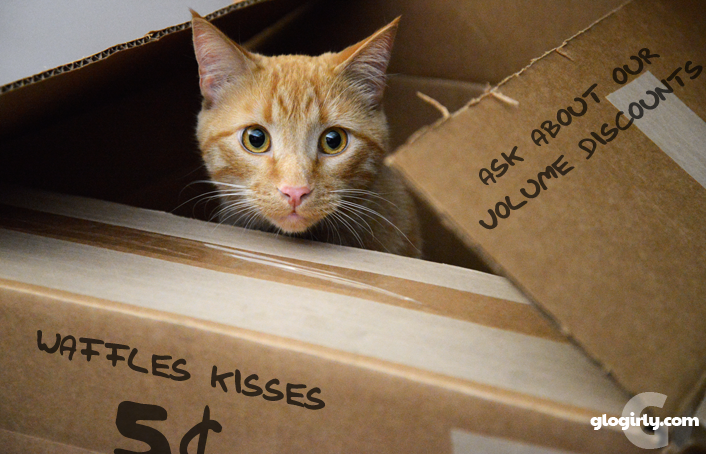 We wanna talk about how many Waffle kisses we get in a bulk discount. Happy Box day :) Waffles you are very intrepid!! If Truffles charged 5 cents per kiss I would go bankrupt!!! HAHAHAHA!!! Mom wants the volume discount! Mum wants to buy elebenty sixty tree kisses please. You are so funny, Waffles. I love your tent and submarine. We love boxes in the Warehouse apartment too and there always seems to be one somewhere...and we especially love when Glogirly draws on the photos with Photoshop! 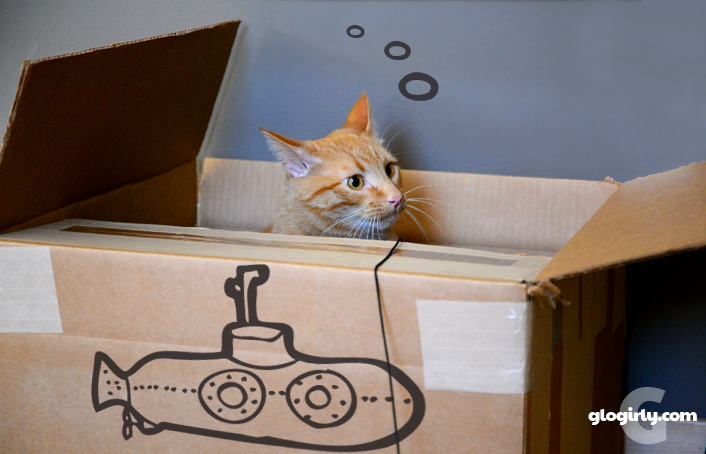 That pic of Waff in the submarine box is the cutest ever! I don’t have scratch. I give scratch.